Tovino Thomas as the leading man, Urvashi playing a woman who may be his mother, pretty shots of the Kerala countryside, and glimpses of parts of Lucknow that even Hindi cinema rarely visits – what’s not to like? Answer: the lack of substance. Jose Sebastian’s Ente Ummante Peru is interesting only to the extent that here, unlike in most Indian films where kids go in search of a parent, this kid is not looking for his Dad from whose existence he hopes to gain respectability or from whom he intends to demand to know why the man abandoned his wife/girlfriend and child, nor is he longing for maternal love (like, say, Vineeth Sreenivasan’s character in Aravindante Athidhikal). Here, instead, he hopes to re-acquire respectability by adding a mother figure to his life. That’s a change for the better...I guess? But wait, let me not get ahead of myself. This is the story of Hameed who discovers, upon his father’s death, that Papa was married to two women, one of whom, he assumes, is his Mum. He sets off to find her, because his worth as a potential groom has fallen, it seems, since he is now an orphan. It feels odd to have that word applied persistently to a full-grown adult played by the strapping, muscular Tovino Thomas, but the writers (Sebastian himself and Sarath R. Nath) must have had something in mind when they sent Hameed off on his Mommy quest. Whatever that something was, it is still within the confines of their minds. There is an atom of an idea somewhere in there that could perhaps be expanded into a good screenplay someday, but that day has not yet arrived. Senior women film artistes struggle to find substantial roles and strong scripts, so I can kinda understand why an actor of Urvashi’s superstar stature signed up for this project, but men of all ages, especially of Thomas’ age, face no such drought, so I wonder what this sought-after youngster – with films like Oru Mexican Aparatha and Mayaanadhi under his belt – saw in this directionless writing. Ente Ummante Peru does have some things going for it though. There is, for instance, some humour in the banter between Hameed and his close buddy played by Hareesh Kanaran a.k.a. Hareesh Perumanna. And Mammukoya as Hameed’s other arch ally is a dear because, well, he is Mammukoya. I also enjoyed the sights and sounds of Lucknow, especially the imposing mansion and the decaying old-style haveli Hameed visits. For a part of this stretch, Sebastian also manages to conjure up an air of mystery around Urvashi’s character Aishu, another woman who is introduced late into the plot and an intriguing youth we see only from a distance. Somewhere around this time Hameed asks Aishu, “Who are you?” The answer never comes, and we never quite get to figure out why Hameed or Aishu do any of what they do, or why Hameed becomes so desperate to find his mother (even his desperation to be married not being a believable explanation). The screenplay also offers little reason to feel invested in their relationship, or the story of Hameed’s late father, the son’s relationship with the old man, or even his equation with the young woman who is the reason why he goes off looking for his mother in the first place. The narrative is lifted up by several notches with the entry of Urvashi who has more charisma per fingernail than most people can summon up with their entire personality. It is particularly commendable that she makes Aishu so striking considering that the woman is curt and unappealing. Thomas is always easy on the eye and a pleasant presence, but the lack of chemistry between him and Urvashi is a reminder of how dependent good acting is on good writing. 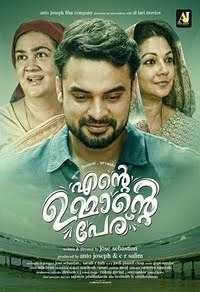 There is, after all, only so much that even the great Urvashi and sweet Tovino Thomas can achieve with a clueless script.